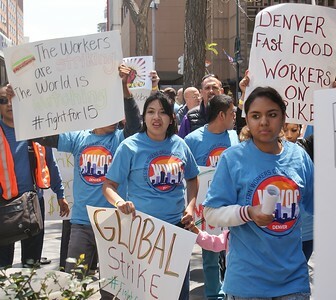 Fast food workers in Denver protest for $15/hr wage and the right to a union. 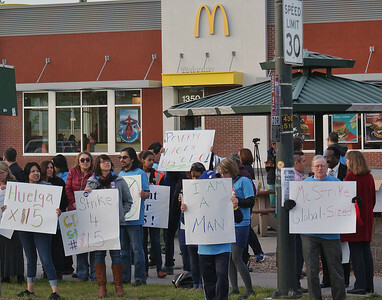 Includes images of demonstrators with signs outside a McDonalds restaurant, protesters marching on city sidewalks and protesters holding a demonstration inside a Taco Bell & a McDonalds restaurant. 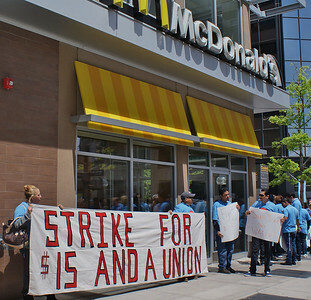 Fast food workers with signs demonstrate outside McDonalds restaurant, "Golden Arches" sign behind them. 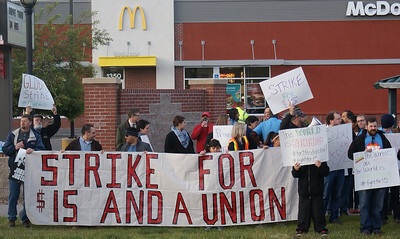 Fast food workers protest out side McDonalds restaurant holding large banner. 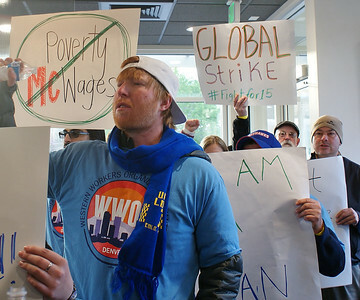 Protesters with banner calling for union and higher wages, outside McDonalds restaurant. 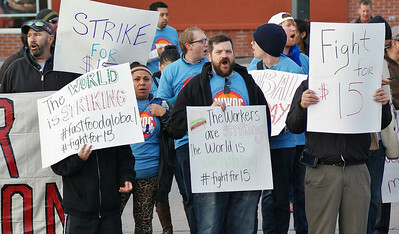 Large group of protesters with signs calling for $15/hr wage. 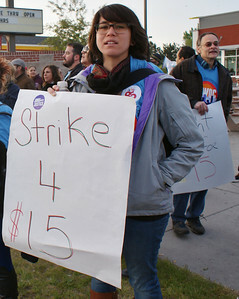 Protester with "strike for $15 sign. 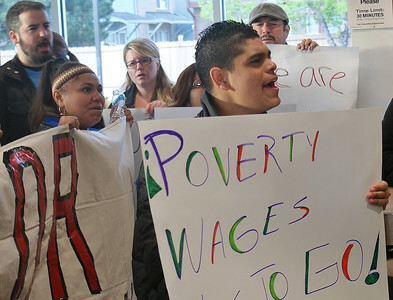 Protesters with signs calling for higher wages, demonstrate inside restaurant. 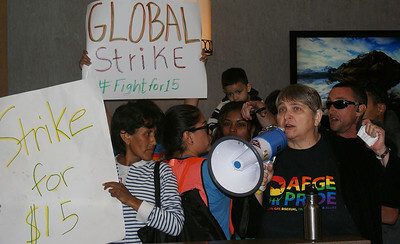 Hispanic woman speaks through bullhorn to protesters with signs inside restaurant. Woman with sign shouts during protest inside restaurant, other demonstrators with banner in front of her. Woman speaks through bullhorn to group of demonstrators inside restaurant, msany holding signs. 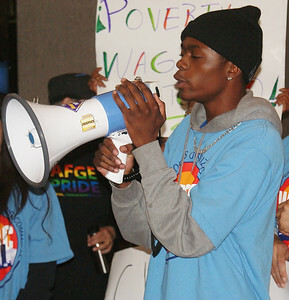 Young African-American man speaks through bullhorn at fast food workers protest inside restaurant, other demonstrators beside him. 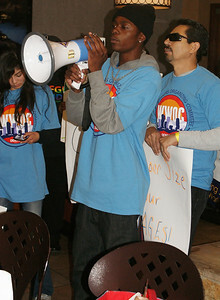 Young African-American man speaks through bullhorn at fast food workers protest inside restaurant. 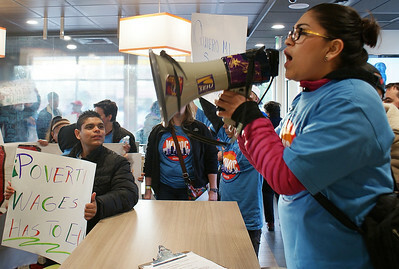 Young Hispanic woman speaks through bullhorn at fast food workers protest inside restaurant, young African-American worker stands next to her. 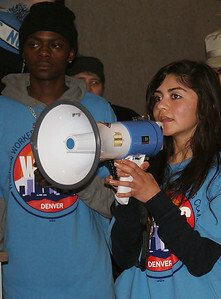 Young Hispanic woman speaks through bullhorn at fast food workers protest inside restaurant. Woman peeks over top of banner, only eyes and top of head visable, other protesters behind her. 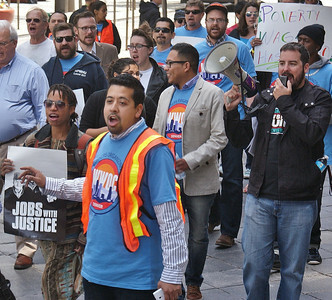 Young hispanic man holding sign objecting to "poverty wages", other demonstrators behind him. 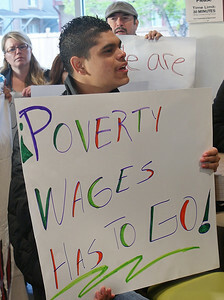 Young hispanic man holding sign objecting to "poverty wages". 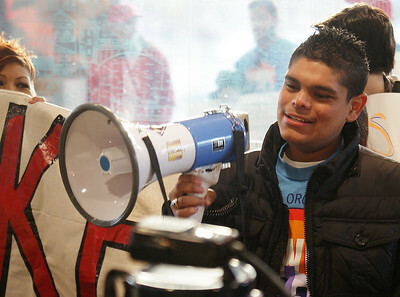 Young man smiles while holding bullhorn. 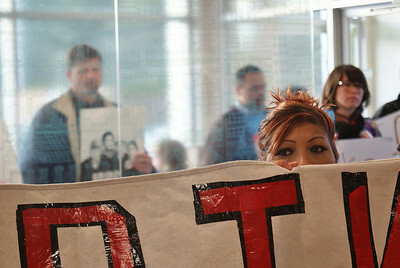 Woman with sign during protest inside restaurant, other demonstrators with banner in front of her. 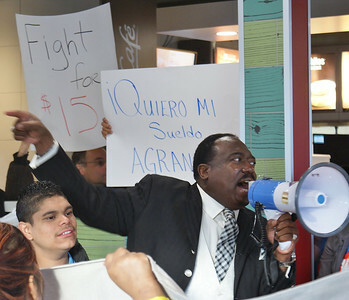 African-american man in suit and tie gestures while speaking through bullhorn to group of demonstrators with signs at fast food workers protest. Large group of protesters march and shout, one speaking through megaphone. 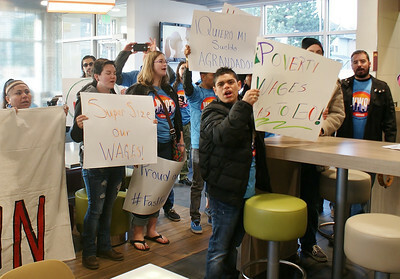 Young hispanic women march with sins at fast food workers protest. 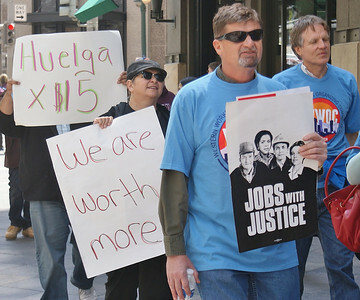 Marchers at fast food workers protests, including one with sign in Spanish. 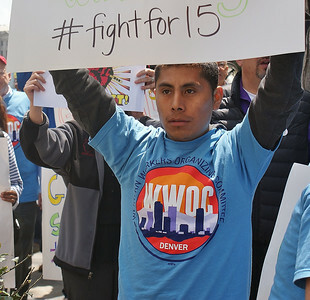 Young hispanic man wearing union t-shirt, holds "fight for $15" sign above head. 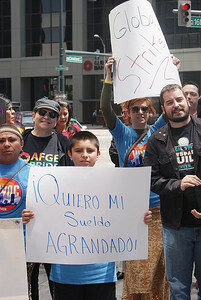 Hispanic father with young son on shoulders holds sign at fast food workers protest, young woman with sign, next to them. 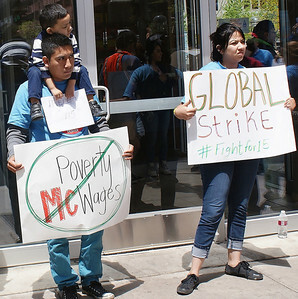 Hispanic father with young son on shoulders holds sign at McDonalds fast food workers protest. 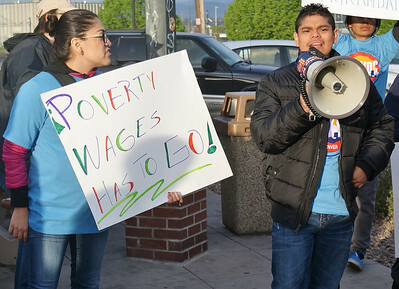 Young hispanic man speaks through bullhorn, woman with sign about poverty wages, next to him. 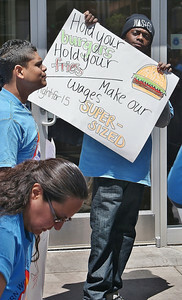 African-american fast food worker holding sign protesting low wages. 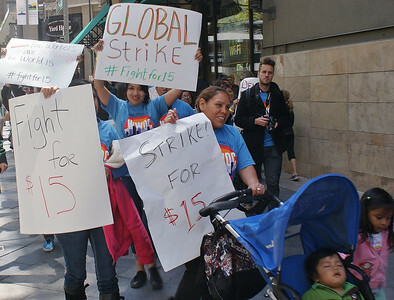 Young woman raises fist in the air and shouts, two small children behind her. 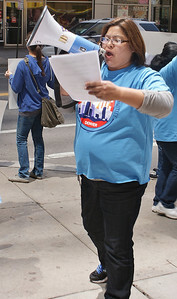 Woman speaks through bullhorn while reading paper in her hand. Two young men, one African American, one Hispanic, hold banner. 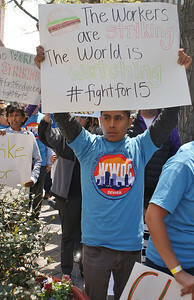 Young boy holds sign in Spanish at fast food workers protest. 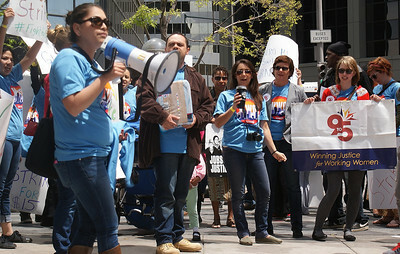 Hispanic woman with two young children, one in stroller, marches at fast food workers protest, other demonstrators behind her. 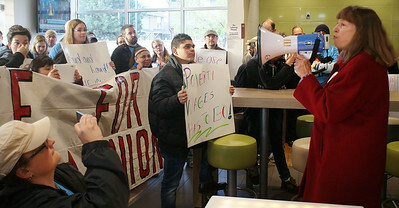 Woman at fast food workers protest speaks through bullhorn, other demonstrators with signs in background. Young African-American man being interviwed by Telemundo, TV reporter with microphone. 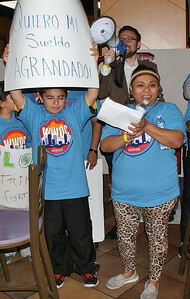 Hispanic woman and young son holding sign in Spanish, at fast food workers protest inside restaurant. 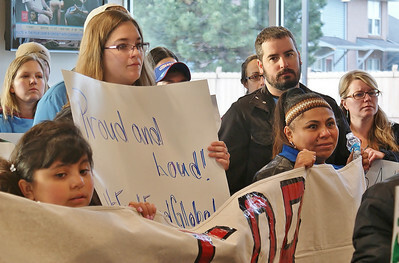 Three young women at fast food workers protest inside restaurant. 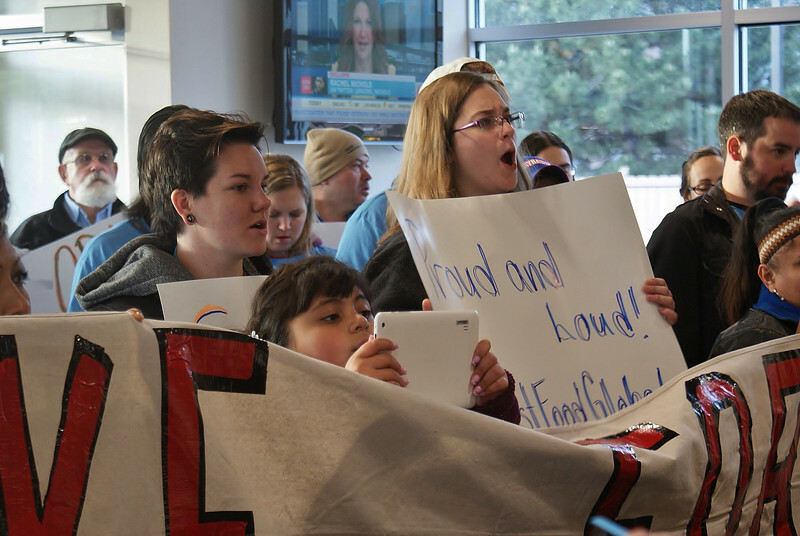 Young man with red beard, wearing scarf and union t-shirt, listens to speaker, other protesters behind him. Woman wearing AFGE shirt speaks through bullhorn at fast food workers protest in side restaurant, protester with sign behind her. 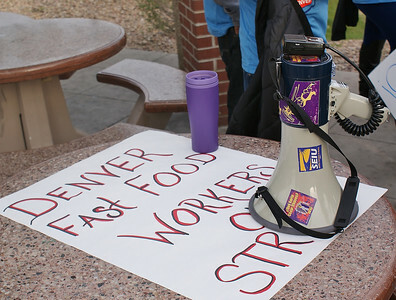 Bullhorn sitting on table, on top of fast food workers protest sign.